Clifford Carwood Lipton, 81, of Southern Pines died Sunday (Dec. 16, 2001) at FirstHealth Moore Regional Hospital in Pinehurst. A memorial service will be conducted at 2 p.m. Wednesday at Brownson Memorial Presbyterian Church with Dr. Grady Perryman and the Rev. David Cagle officiating. 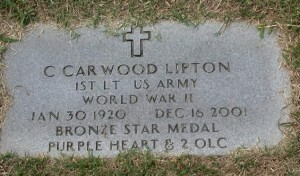 Mr. Lipton was a 1938 graduate of Huntington High School in Huntington, W.Va. He graduated from Marshall University in 1948 with a bachelor’s degree in engineering science, majoring in physics. Mr. Lipton enlisted in the U.S. Army specifically for the paratroops in August 1942 and was assigned to Company E, 506th Parachute Infantry Regiment, 101st Airborne Division, then being formed at Camp Tocca, Ga. He trained at Tocca and Fort. Benning, Ga., Camp McKall and Fort Bragg. Mr. Lipton jumped into Normandy as plane jumpmaster and platoon sergeant of 3rd platoon of E Company the night before D-Day. He returned to E Company after six weeks in the hospital and jumped into Holland on Sept. 17 as plane jumpmaster and first sergeant of the E Company. After 72 days in combat in Holland, he moved with the E. Company to a new base at Mourmelon, France and from there, on Dec. 19, 1944 to Bastogne, Belgium to help contain a German break-through there. He was given the command of the 2nd platoon of the E Company during the Bastogne fighting and was awarded Battlefield Commission at Haguenau, France on Feb. 16, 1945. In late April 1945, the 506th moved to Austria to clear the last SS troops from there and from Berchtesgaden. Mr. Lipton retired from Owens-Illinois as a director of development international technical assistance after 36 years of service. Sixteen of those years were in the international division. After his retirement on Nov. 1, 1983, he moved to Southern Pines. Surviving are his wife, Marie H. Lipton; three sons, Clifford Carwood Lipton III, Thomas Denton Lipton and Michael Forrester Lipton; a brother, Robert Dulaine; five grandchildren and one great-grandchild. Memorials may be made to Brownson Memorial Presbyterian Church, Building Fund, 330 S. May Street, Southern Pines 28387. Powell Funeral Home is serving the family.